Cross Country provides rock shield products from Tuff-N-Nuff and Conwed Plastics. Tuff-N-Nuff is 11mm thick P.V.C. strand extruded pipe protection pad with excellent compressive and impact strength. Flexible pads or rolls come in convenient sizes and can easily be installed by two or three men so labor costs are minimal. Weather is never a problem for our PVC material which is tested from -50 to +120 degrees C. Rolls are ideal for cigarette wrapping and pads are provided for large diameter pipes. Flexible P.V.C. :To accommodate normal pipe movement resulting from ground shifting, thermal expansion or contraction. Porous Texture:Porous. Does not trap water. Allows accurate cathodic testing. Excellent Impact Resistance:11mm - 150.0 in lbs. Color:Yellow. Identifying in ground pipe to third party. Download a printable brochure for Tuff-N-Nuff products. 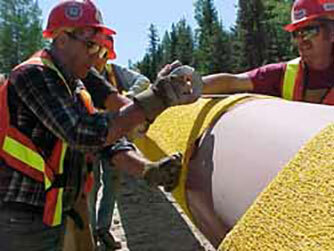 Conwed manufactures PipeSaver™ Rockshield, an extensive product line designed to protect oil & gas pipelines. PipeSaver™ Rockshield helps maintain cathodic flow in natural gas and oil pipelines. Our durable plastic mesh is wrapped around the pipe to protect against debris and rock damage during backfilling and against problems caused by certain soil conditions after pipe installation. PipeSaver™ provides exceptional protection to help minimize rock chips that can eventually cause corrosion. Several grades and thicknesses of PipeSaver™ products are stocked and available to meet a wide range of specifications. 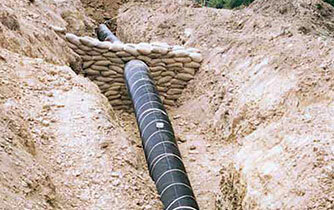 PipeSaver™ is available in convenient 5' x 100' and 6' x 100' rolls. For detailed product information and minimum order quantities, please contact our team.